BDN salutes James Clarke on his achievement of collecting 100 medals from finishing 100 races. James Clarke, who has Usher syndrome, woke up on New Year’s Day in 2008 and committed himself to a challenge that would consume him for another eight years. A keen runner, he decided to attempt to collect 100 medals from 100 races. The races were of all different lengths and in a variety of locations across Britain and abroad. 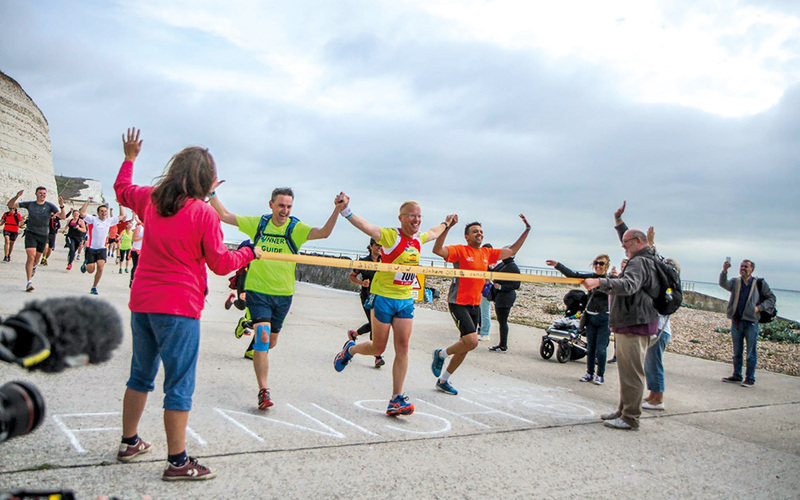 On Saturday 17 September 2016, James crossed the line in Saltdean to finally complete his amazing challenge. Appropriately it was Usher Awareness Day. James is 38 years old and has Usher syndrome. He was born in Chesterfield, Derbyshire and now lives in Purley, London. James says: “I haven’t actually ever worked but that’s a long story. I’ve never had the confidence to go out and find work. I’ve just been focusing on the challenge in hand: the 100 medals. In 2012 James also completed a leg of the Olympic Torch Relay in Derby. He ran a total of 300m with the torch. When did the idea to do 100 runs for 100 medals come to you? The idea of achieving 100 run medals came from my love of running. I’ve enjoyed running from a young age, especially at school where my inspiration came from my P.E. teacher. It was that teacher who influenced me to run. 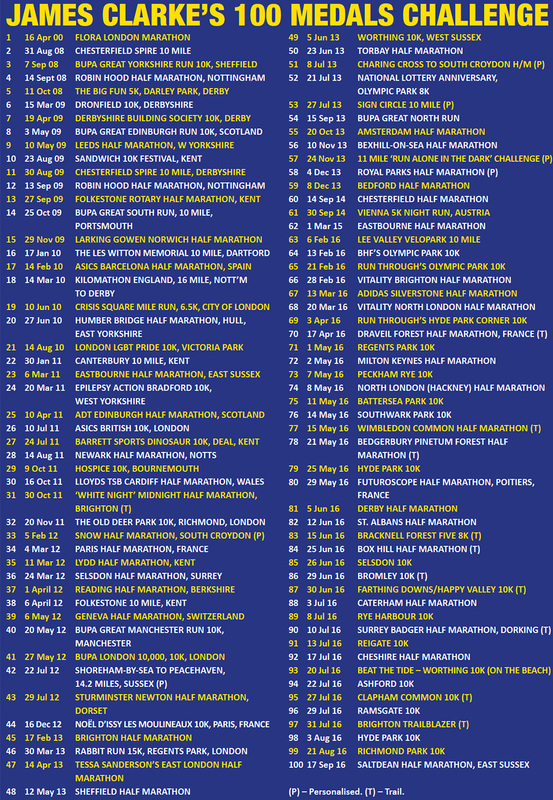 I had only ever competed in one long distance run prior to deciding on the challenge and this was the London Marathon in 2000. So it was eight years later that I decided to pick up where I had left off! The first run out of the remaining 99 was in August 2008. This was in Chesterfield. It was a 10 mile run where the route took me up and down hills. It was a tough run. Did you ever feel like the challenge was beyond you? At times I did feel that the 100 runs were going to be a challenge that would defeat me, especially after my 50th run. I had a feeling that I should just give up. The goal was too far away, it had taken me so long to get to where I was but I couldn’t see it ending. I got to the half-way point in 2013. It had taken me 5 years to get there. But I carried on and I was pleased that the last 50 were completed quicker than I expected. Which was the hardest race of the 100? to keep my balance and take one step at a time. Other runners were flying past me. But I did it and it was a satisfying feeling to do so. The merchandise on the day such as our T-shirts and cups were printed with the words ‘The hardest run in Britain’ and it definitely was. What is your favourite race length? My favourite race is the half marathon. A 10k is quite easy and a full marathon is ok but with a half marathon I’m in my comfort zone. Throughout the 100 I ran about 40 times on my own and the rest were either accompanied or with a guide. Describe your training regime ahead of each race? With regards to my training this has never been a constant. Some months were intense and in others I felt like I couldn’t be bothered anymore. Throughout the 8 years there have been so many ups and downs. The amount of times I trained in the week would change and so would the length. Sometimes I would run 2, 5 or 10 miles but this year I hardly trained at all. I mainly just turned up on the day of the run and did it comfortably. I wasn’t interested in personal best records and beating them it was more about actually achieving the 100 medals. It was the enjoyment of taking part at my leisure that kept me going, the atmosphere of running with others and passing the crowd cheering everyone on. My eyes did make it difficult for me but I wanted to forget about that, I wanted to forget about the barriers it gave me and just focus on the run and being equal to the other runners. Of course I know I’m different. I can’t see well and I am deaf but that didn’t stop me. Who are your sporting inspirations? There is no particular sportsperson that inspired me. There are a few examples of great athletes but not anyone in particular that I would say I looked up to or wanted to be like. My other passion is football. I am a massive Liverpool fan and I get more engrossed in watching that than I do with athletics. 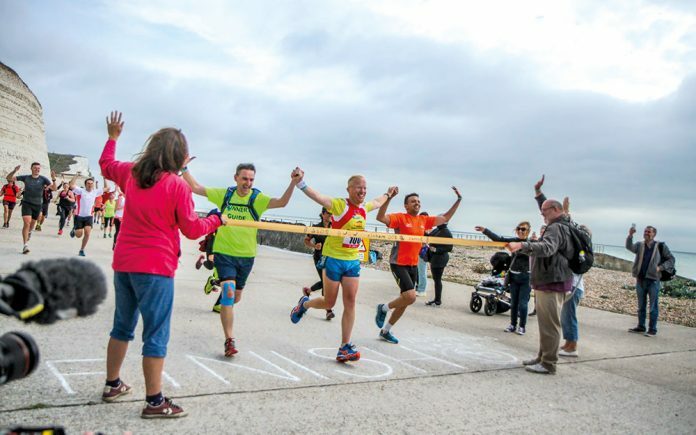 Tell us all about your 100th run at Saltdean? 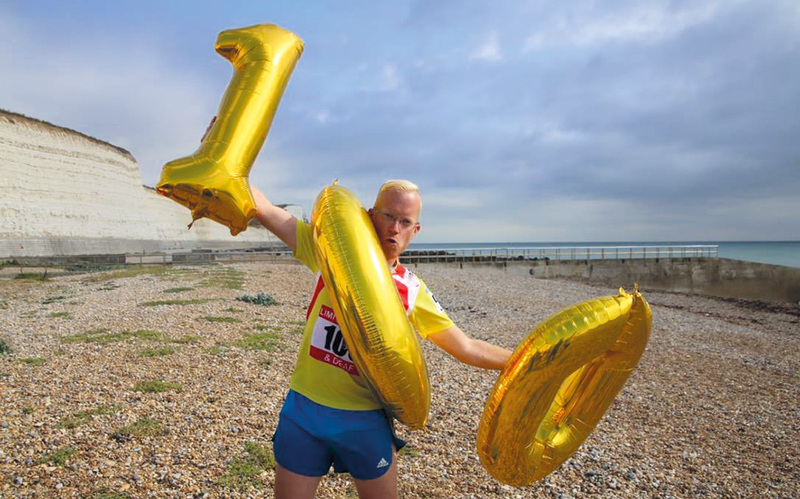 The 100th run in Saltdean was memorable. Saltdean was my home for one year. The day was perfect. It was faultless from start to finish. It was just beautiful. I’m glad I invited runners from all backgrounds and levels: beginners, intermediate and experienced runners, deaf and hearing. There were people from Britain, France, Nepal, and South Africa. There were people from different ethnic backgrounds too. My hearing cousin came along. We all got together, about 40 of us, those who were running 21k set off down the windy paths until the group who were running 10k joined us and on we went and then the 5k group joined and then the 3k group making us a whole group crossing the finishing line. The weather was perfect; it wasn’t too hot which if it was would have been unfair on the beginner runners. It was a bit cloudy which caused a bit of breeze that was nice to run in. The path was alongside the cliff and it was very quiet which made it easier for us to run. It was a great community event, full of smiles and enjoyment, humour and celebrations. After the race was finished we made our way to the reception to continue the celebrations. This was a great event in itself. I’ll never forget it. I had the 100 medals there and balloons in the shape of the number 100 and a special thank-you went to the volunteers of Deaf Diaspora who helped provide the food and drink and also the video coverage of the whole event. I was not expecting it all. It was rather overwhelming. Have you thought about your next challenge? My next challenge remains undecided. The past 9 months have been solely dedicated to achieving the last of the medals and I think I now need a rest. I need to decide if I want to continue to run or to take on a completely different challenge. I have thought about going into modelling but on the condition that my red and white (Deafblind) cane is featured in the photos and I don’t know if that would be accepted in the modelling industry! But it is something I would like to do as I am proud of my Deafblind identity. To see all his achievements see his Facebook page.